Tranquil weather will continue through Thursday. Forecast focus moves to the next strong cold front pegged to pass on Saturday. Today and Tonight: Ample sunshine is ahead for your Wednesday. Additionally, as north wind shift east, expect temperatures to respond by climbing higher than Tuesday and into the upper 70s. Overnight will be clear and cool with lows in the low to mid 50s. Up Next: More sunshine is expected on Thursday with highs reaching for the 80s. Similar numbers are in store for Friday as the atmosphere begins to change. Onshore flow will result in some humidity and clouds coming back. In the return flow, a shower or two may develop late Friday. A strong cold front will work into the area on Saturday and a round of rain and thunderstorms is anticipated. This system could result in strong thunderstorms and a couple of inches of rain. Exact timing will become clearer as we approach the weekend. It does appear as though the front will work eastward by Sunday allowing sunshine and cooler temperatures for the end of the weekend into early next week. High pressure settling southward from the Upper Midwest will bring quiet and nice conditions through Thursday. As the high shifts to the southeast and winds turn around, temperatures will moderate by a few degrees each afternoon, reaching the 80s by the end of the week. A deep trough moving across the United States later this week into the weekend will push another cold front across the area. The trough is expected to begin taking on a neutral to negative tilt as the axis pushes across Louisiana and Mississippi. Immediately ahead of the boundary on Friday, severe weather parameters are high but forcing is limited. By the time the front arrives on Saturday and forcing increases, severe weather parameters are lower and likely, not high enough for widespread severe thunderstorms in southeast Louisiana and southwest Mississippi. Accordingly, historical analysis of the expected scenario shows the greater likelihood for severe thunderstorms in northeast Texas, north Louisiana and central Mississippi. Obviously, a very subtle shift southward could mean an entirely different outcome for the local area so these variables will still need to be watched closely. At this time, it appears as though there will be just enough instability and wind shear for isolated damaging wind gusts and possibly a tornado. 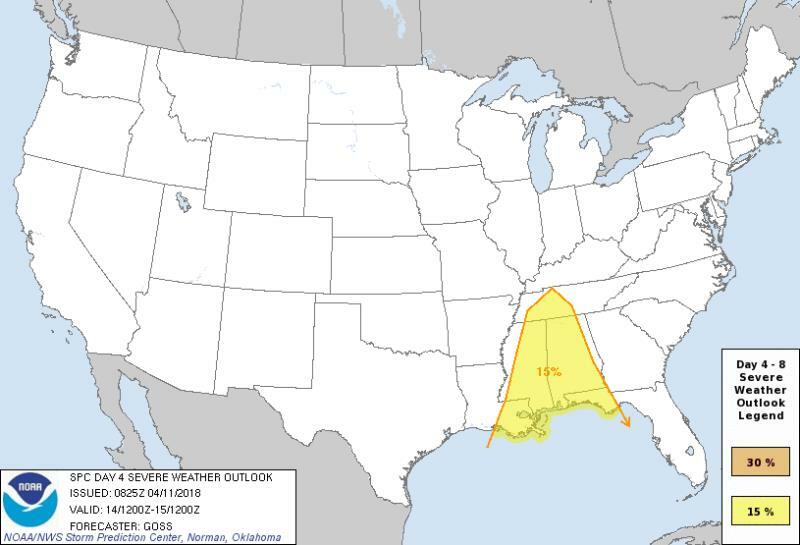 As of now, the Storm Prediction Center has outlined the eastern two thirds of the forecast area with a 15 percent chance of severe thunderstorms within 25 miles of a point on Saturday. On the other hand, precipitable water values will be in the top 20 percentile for the time of year and nearly unidirectional vertical wind profiles may result in a slow moving batch of rain and thunderstorms along the front with some training possible. Forecast models give potential of up to three inches of precipitation. Timing of this event is not yet clear as the GFS is faster bringing action through Saturday morning while the ECMWF and Canadian are later with afternoon activity. The cold front and trough will rapidly move east on Sunday allowing skies to clear out and temperatures to fall. Cool and dry weather is anticipated through Monday.